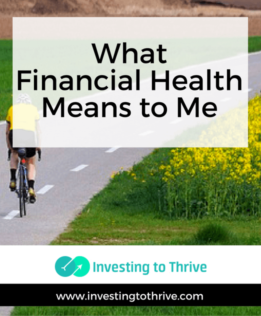 This post is part of the #FinHealthMatters financial health campaign and my entry in the blog post competition sponsored by Center for Financial Services Innovation. For example, in July I'll be traveling to Iowa for RAGBRAI (The Register's Annual Great Bicycle Ride Across Iowa). Accompanied by a group of friends (including one who is kindly supplying a van to transport people, bicycles, and gear), I'm taking several vacation days to take part in this epic cycling trip. I'll be riding my bike about 50 miles daily for several days, stopping to enjoy the hospitality (and food) of small-town Iowans, and camping at night. Tending to my financial and physical health has equipped me with the ability and motivation to participate in this event. Getting to this point in life has often required thinking about and planning for the future, controlling my day-to-day spending as best I could, setting aside money for savings and retirement, and investing in my health — by setting aside time to run, cycle, etc. and eat as healthfully as possible. While I could have borrowed more to live in a larger house or drive a more luxurious car (or spent more time shopping or watching movies), I opted to live in a simpler way that fit my desires and my balance sheet. I've been training over the past few months to get ready for this long ride. But my efforts to develop and improve my cycling prowess have been years in the making. I started slowly and with little confidence, using my childhood and teen years — when I was very active — as my foundation. There were years in which I made little or no progress, times when I experimented with new techniques, moments when I eagerly adopted pro-like tips and instances when I ignored them. As a middle-aged adult returning to road on a bicycle, I tapped wisdom from my fellow cyclists and steadily gained in speed, endurance, and mental strength. During this time, I've enjoyed riding alongside fellow athletes who embraced the same values as me: a love of outdoors; a desire for good health, physically and emotionally; and a commitment to putting in the effort without (too much) emphasis on specific outcomes, knowing that I'd certainly be better off with a bicycle ride than without one. I've gained confidence and courage on the road, and yes, become more scared of dogs (and indecisive squirrels) who unpredictably dart out in front of cyclists than cars and trucks with drivers who tend to act in a predictable manner. I've learned to assess and manage risk, accepting that I can scan for and react appropriately to danger but can't control everything that happens in the world. Similarly, I have listened and sometimes heeded professional financial advice — and sometimes rejected it when I deemed it unsuitable for my stage of life, approach to finance, and personal preferences. I've considered and implemented methods for savings, debt pay-off, budgeting, and investing that motivate me. I've adopted new ideas that have benefited my financial health, seeing incremental improvements that have sometimes led to exponential growth. I've realized that certain guidance relevant to a higher-earning audience, similar to the training regimens of elite athletes, may or may not have merit for my situation. Happily, I enjoy pursuing financial and athletic goals (and realize that I may be unusual and unusually fortunate in this regard). I find pleasure in making deposits in my health, financial and physical. As a little girl, teenager, or young adult, I never planned to ride in RAGBRAI just like I never planned to send my youngest son to an out-of-state college to earn a degree in aerospace engineering. But having excellent financial health has meant that I have the flexibility to take advantage of challenging, meaningful, and and occasionally costly experiences.